Unlike our speedy society, there is a place where no regular opening or closing time exists. Unlike the standardized franchise restaurants, small but unique restaurants wait for people. There, time seems to go slower than other places in Seoul. It is Seochon. Two famous places where Hanoak, a Korean traditional house, is well-reserved are Seochon and Bukchon. Both have characteristics that are unique, and they cannot be paralleled: Bukchon upholds a Korean traditional architecture and ambience; Seochon is not as grand or original as Bukchon. However, it feels like home. Seochon gives us a comfortable and homely image. While wandering around the alleys, you can behold beautiful sights in which past and present co-exist. In addition, modern and contemporary historical meanings are retained in Seochon. The UOS Times will introduce Seochon, a place that has appealing features and meaningful values. If you walk through Seochon, you can see lots of small or big galleries and artists’ workshops. These galleries are open to anyone who wants to look around for free. How did Seochon become the village of artists? Unlike other regions, Seochon was the region where the middle-class people in the Joseon Dynasty lived. This factor explains why Seochon is a reformed Hanoak village, as opposed to Bukchon which retains traditional Hanoak. The reformed Hanoak is not as magnificent or grand as the original, but it is familiar and cozy to common people of the 21st century. 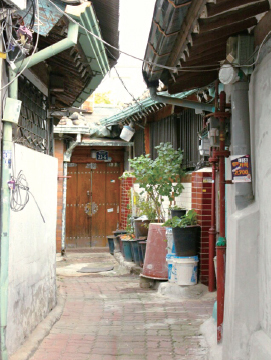 One of the most appealing points of Seochon is complicated alleys. You could easily lose your way or wander around if you do not have a map. However, you could find more homely and loving sights while roaming around the alleys. This unique yet well-acquainted image of Seochon has been giving artists a great impression and explains why so many artists and writers who are symbols of certain periods such as Jeong Sun, Lee Sang, and Yoon Dong-ju all lived in Seochon for a long time. Having lived in Seochon, they were inspired by the people, the alleys, and the nature of Seochon and were able to create great works. You can visit the Yoon Dong-ju Literature Museum or Lee Sang?s House and feel their spirits. This love of artists for Seochon continues up until the present day. Walking around Seochon, you can find footmarks of time. The history of Seochon is visible everywhere in the streets and on the buildings. 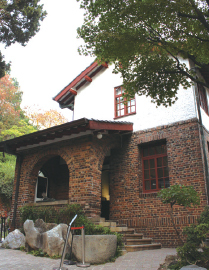 Park No-su’s House shows a Korean house design in the 1930s; It is a mixture of Korean, Chinese, and Western styles which shows the track of time through Korean history, depicting designs from the end of the Joseon Dynasty. This house was initially built by one of the leading members of the pro-Japanese party. After Korea gained independence, an Eastern-style painter, Park No-su bought the house and donated it to the country as a cultural asset of Jongnogu which became a museum for the citizens. Now, there is an exhibition in honor of him. You can visit the house and see the artworks of Park, in the inside as well as the outside such as a sculpture park and garden which have artistic and historical value. Among those valuable works, the most impressive thing was backyard garden. At the garden, there are trees, small pond, antiques. In addition, there are small rock benches that people can sit and rest for a while. When I walked the garden, two women were already sitting there and enjoyed the sight. Although it was only a small garden with pond, it had a cozy and neat atmosphere at first. However, after taking a view, I could see a well-mixed image of Korea, Japan, and China. 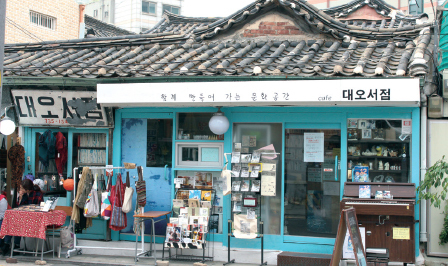 Not only are there cultural assets in Seochon, but also the oldest bookstore, now a case in Seoul is there. The name of this place is Dae-oh. In the past few decades, many secondhand bookstores were opened around the village. It used to be natural for people to prefer to go to secondhand bookstores to buy books. However, ever since big franchise companies entered the book industry, small independent bookstores or secondhand ones have slowly been losing their grounds one after the other. 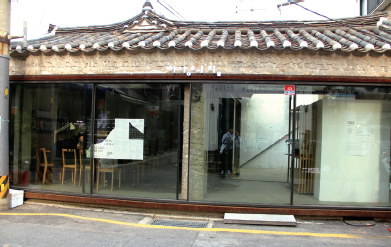 Dae-oh Bookstore has also had troubles maintaining its business but it chose not to change its exterior; It, instead, changed itself as cafe, the place where people of Seochon unites as a community. As a result, Dae-oh Bookstore has become not only one of the major tourist attractions but also a filming site of series or music videos. When we went to Dae-oh Bookstore, already many people were visiting and taking pictures. If you want to go inside of Dae-oh Bookstore and take a look, you each have to buy a cup of tea or coffee. Although it changed its business to a cafe, there are still many old secondhand books piled on the bookshelf. There are also antiques such as reed organ, old school desk and chair for decoration which could remind childhood memory. Even though Dae-oh Bookstore has nothing extraordinary compared to other cafe, it gives us reminisces of the old days. The people in Seochon will welcome you warmly. They will not treat you like a stranger. You can feel an amiable and relaxed ambience while walking around Seochon. Furthermore, you can find many places and hidden treasures inside every alley. You can be reminded of your childhood, or make memories with your beloved ones. Maybe, this ambience can be the most fascinating feature of your visit to Seochon. 1) Subway : Get off at Gyeongbok Palace Station on subway line 3, exit through gate 2 or 3. 2) Bus : You can take Bus 272 and get off at Sajik-dong Community Center Station and walk toward Gyeongbok Palace Subway Station.